Barbara Denk, an architectural designer and photographer, is the co-author of The Abundant Garden (2005). The book identifies design aspects of an abundant garden and features Denk's own photographs to illustrate them. Plant recommendations and practical tips are included as well. 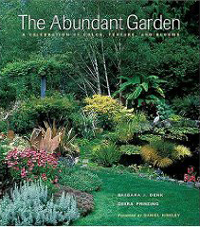 For local readers it will be of interest to note that each garden featured in the book is located on Bainbridge Island. Denk describes her inspiration for the book as follows: “A Northwest native, I’ve always loved anything beautiful. ... I was drawn to the garden art and architecture around my community of Bainbridge Island, outside Seattle. At first, I ignored all the plantings in favor of the artwork, but these gardens soon stole my heart. I was just captured by the beauty in my own corner of Puget Sound."